DPI’s,PDF’s, JPEG’s, and XCF!! oh my! THe easy part, was producing the illustrations. Now I had to photograph them and send them in a particular format so that they would reproduce cleanly. I didn’t know what a ride that would turn out to be for me. I was told that photographs were 72 DPI or dots per inch. The needed to be 300. How did I do that?! The Editor couldn’t help me. I was on my own, or needed to find someone to do that for me. Well I found someone, but got stubborn and thought I needed to learn this myself. Photoshop was of course the perfect software to use. But there were several versions, and it was quite expensive. While cruising the internet, I found Gimp and it was free! Now I just had to learn how it worked. I don’t know how I stumbled through it all, but I did learn how to change the DPI’s, except that in Gimp, they called it PPI. I learned how to manipulate colors and enhance the drawings. The next test was sending them in. The Editor couldn’t open the attachments. It was unknown! I had to send them as JPEG’s and Gimp sent them as XCF. I did figure it out. I did get 5 illustrations sent to Tate. They are going into an insert at the back of the book, so that they will be in full color. Tate has been wonderful to work with, and I can’t wait to see the end result. 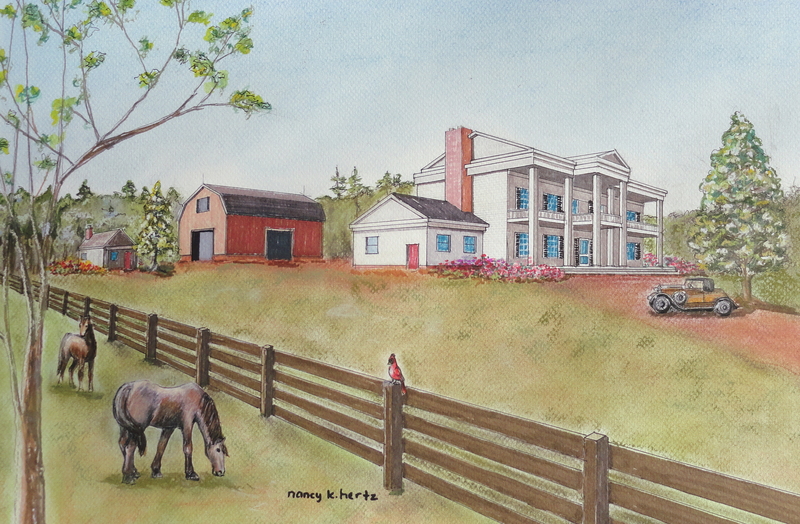 Here is one of my Illustrations, The Hatcher Farm.